The Orion-MPCV capsule in the acoustic chamber at the Lockheed Martin Waterton Facility in Colorado. A special prototype of NASA's planned deep space vehicle is undergoing vigorous testing this month to help engineers design the capsule that could one day take astronauts to destinations such as an asteroid or Mars. The spaceship, called the Multi-Purpose Crew Vehicle (MPCV), is based on capsule designs that were originally intended for NASA's Orion spacecraft, which was part of the agency's now-defunct Constellation program that aimed to return astronauts to the moon by the 2020s. This summer, engineers are running a prototype MPCV through a series of tests that will help collect valuable data on the vehicle's ability to withstand the sound pressure of a launch and the dynamic forces of a water landing. This week, the MPCV will undergo a battery of tests in an acoustic chamber at Lockheed's facilities in Colorado. 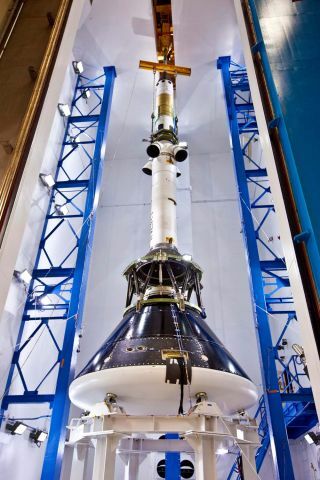 The capsule, with its mounted Launch Abort System, will be exposed to sound pressure levels exceeding 150 decibels, similar to those expected at launch. "It's a buildup of configurations so we can understand how each of the various components respond to the acoustic environments," Paul Sannes, an acoustic test expert at Lockheed told SPACE.com. "What we do with the data is use [it] to compare predictions for the responses that we see. Things like tanks that hold fuel, thrusters, vehicle computers and avionics, antennas — all the components of the vehicle — so we understand what we need to build a capable and robust vehicle." Four separate tests will be completed in Lockheed's acoustics chamber this month. Engineers will compare the data they collect to their test predictions to see if they match up, Sannes said. If there are wide discrepancies, the team reassesses the predictions that were made using models to improve their accuracy. By building up this library of data and refining their test predictions, engineers can use models — rather than expensive prototypes — to simulate different scenarios to investigate the vehicle's response, Sannes explained. And while these acoustic tests aim to investigate the vehicle's strength during launch, other tests were conducted last month to help certify the vehicle for landing in the water at the end of its mission. The Orion Multi-Purpose Crew Vehicle (MPCV) Boilerplate Test Article (BTA) is dropped into the Hydro Impact Basin (HIB) during a test on July 21, 2011. These so-called drop tests, or splash tests, were conducted at the Landing and Impact Research Facility at NASA's Langley Research Center in Hampton, Va. The MPCV was essentially attached to swinging tethers that released the capsule into a giant pool of water at different angles and velocities, representative of the entry conditions of a water landing. Three splash tests were conducted between July 12 and Aug. 2 at Langley's Hydro Impact Basin. The 22,000-pound (9,979-kilogram) test capsule was dropped at different velocities, ranging from low energy to high energy, and the tests incorporated other conditions, such as full parachute deployment, shallow drop angles and rough seas, to collect a range of data. "It's very important for the dynamics of impact simulations to understand the orientation and test conditions at release," said Lynn Bowman, a project manager for the MPCV splash tests at Langley. "The initial conditions are really important to start with — the angle that the test article impacts the water, horizontal and vertical impact velocities." Among other things, instruments recorded pressure data, acceleration data and the amount of strain on the test article itself, Bowman said. The results of these initial splash tests will help the vehicle's builders improve their design for the actual flight vehicle. A second round of splash tests will resume later in the fall, with a slightly modified test article that will make it more representative of the real flight vehicle, Bowman said. The gumdrop-shaped MPCV will be NASA's primary vehicle for delivering astronauts to destinations beyond low-Earth orbit, such as asteroids or Mars. With the retirement of the agency's 30-year space shuttle program, NASA has been tasked with sending people to an asteroid by 2025, and then to Mars by the 2030s.